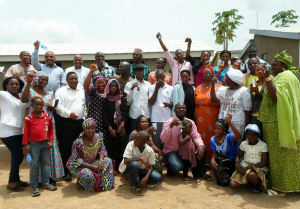 Nigeria is the home of The Fuller Center’s second international partnership. National director Sam Odia traveled to Americus for the grand opening of The Fuller Center’s offices in 2005 and returned home to get started immediately. We are building in Luvu Village, just outside of the capital city of Abuja in the heart of the country. FCH Nigeria has so far completed 97 units. Nigeria is one of the largest countries in Africa and boasts the continent’s largest population. The northern half of the country is predominantly Muslim and the south predominantly Christian. The country has the world’s 8th largest oil reserve, which is both a blessing and a curse. The oil fields generate great wealth, but where there is wealth there is often jealousy and corruption, so the benefits of this national asset do not greatly benefit the population. Lagos is the city most people associate with Nigeria, and it remains the country’s largest city and economic hub. Some 30 years ago the government decided to relocate the capital to the interior and the city of Abuja was founded. Today it is a city of grand avenues and huge complexes that house government offices. It is a lovely city, but too costly for many of the people who work in the government and service industries to afford. So, like so many great cities in the developing world, Abuja is surrounded by vast neighborhoods of poverty. The Fuller Center Nigeria seeks to help alleviate the problem of inadequate shelter for many of these families. The Fuller Center Nigeria has completed construction at Luvu Village and is exploring opportunities for future work. View pictures of our work in Nigeria.